Journey to the Blue Lagoon to take in tropical surroundings while collecting a few special symbols. Click here to play! It will not only be a fantastic time, but a chance to bring in a little extra spending money. The simplicity of this Blue Lagoon is a thing of beauty. You’ll be scouring the waters for just one thing and that’s the elusive clam. Spin this little shell across the reels and you’ll collect a handsome prize. Three on a payline has a top payout worth up to 2500 coins. But if you can spin one or more anywhere on the board of this traditional 3 reel game, you’ll get a win. There are plenty of other symbols on the reels, such as seahorses, puffer fish, and star fish, but remember that it is the clam that you’re really looking for. This game accepts a max of five coins (coin value is adjustable) so be sure to bet all five in order to activate the highest paytable. 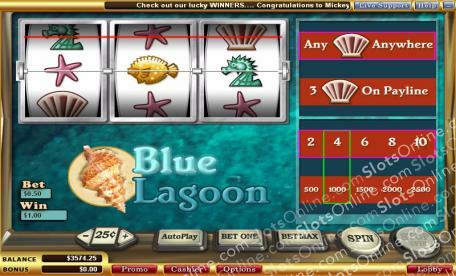 Search this Blue Lagoon for a chance at plenty of fun and a whole lotta cash!